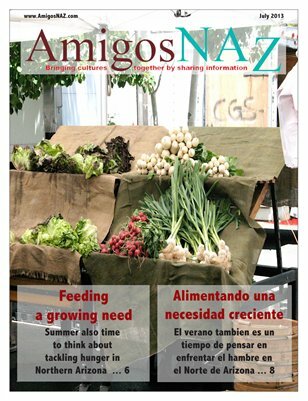 The July 2013 bilingual edition of AmigosNAZ begins with a cover story on the growing challenge facing organizations seeking to feed the hungry in Northern Arizona. The edition also includes information on the “Coconino Community Education Report 2013” and its impact on the region’s Latino community, local stories on education awards presented in Flagstaff, information on a hunger study, an update on the search for the next Coconino County manager, details on the Community Action Advisory Board, a profile on County Supervisor Elizabeth “Liz” Archuleta, a travel column on trekking the Inca Trail, bilingual information on living with fibromyalgia, buying medicines online, ways to improve fuel economy, and how to select the best cuts of meat for barbeque season. All this and more brought to you by AmigosNAZ — Providing information for and about the vibrant Latino community in Northern Arizona.